Our customer operates quarries and sand pits to extract, sell and distribute quarry products. Ecological Vegetation Classes (EVCs) stipulate that the quarry and its surrounding area is of very high environmental significance and therefore the containment of dust pollution is a priority for our customer, and levels are monitored regularly by the local authorities. 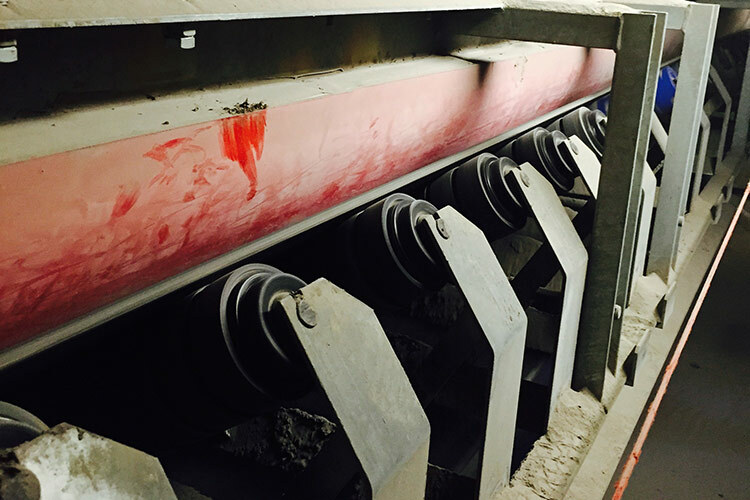 Our customer was experiencing a significant spillage problem around the transfer point where 3 large cone crushers deposited bulk basalt rock on to the conveyor belt. The impact of the load drop created extraordinary air pressure dust blow-outs, forming dense clouds that would disperse heavily throughout the handling area. During production stoppages, manual resources were required on a frequent basis to shovel clear the area around the chute system. Not only did this create a physical labour OHS issue, but breathing in the airborne particles runs the risk of leading to more grave health issues. Dust Containment: Unlike any type of flat skirting (rubber or polyurethane), the flexibility and inherent “memory set” of K-Snap-Loc® is able to form a subtle curved shape to contain the dust. This concave curve is formed by the light downward pressure of K-Snap-Loc®’s bulb head, designed to be simply installed using a Unistrut mount to the outer structure of the cone crusher, hanging down to “float” on the surface of the belt itself. This tight seal securely captures the pressurised airborne dust particles, without causing any damage to the belt itself. Longer Lasting Performance: Being able to effectively contain the small basalt rocks means that these fines do not get lodged between the skirting and the conveyor belt. This was leading to rips or tears in the polyurethane. As a result of the containment, the hardness tolerance of the R69 specified durometer polyurethane is not compromised and the K-Snap-Loc® can perform to its full potential, lasting longer in production. With the clouds of dust in this confined transfer space now gone, the maintenance clean-up tasks are no longer required, and team members are no longer at risk of the OHS issues. The investment in K-Snap-Loc® also means that not only does production continue with fewer stoppages, but less replacement skirting needs to be purchased in the future.